There really isn’t enough live sewing so this weekend I’m going to make this cute little doll coat and matching hat and blog as I go. No time limits and I reserve the right to take naps. This is the pattern. Am making the hat and coat. The pattern suggested flannel but I’m using navy felt which I found in the curtain section of John Lewis. As it’s thicker than flannel, where the pattern calls for two layers, I’m using a polkadot cotton. 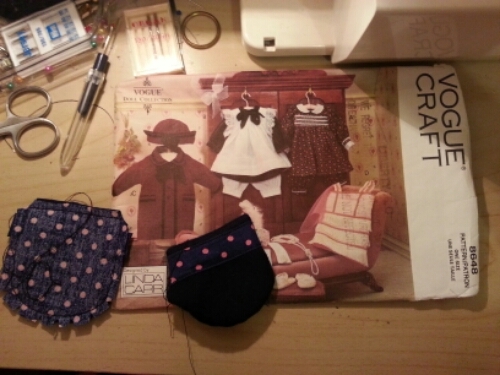 So far I’ve made the two little pockets. They have a spotty trim but no braiding on top as I’m going to decide if I want it when it is done.